Under contract with Washington DOT Tetra Tech received 7 task orders to produce orthoimagery along State Routes in Washington State. The imagery had been previously acquired with an UltraCam Falcon Prime camera. 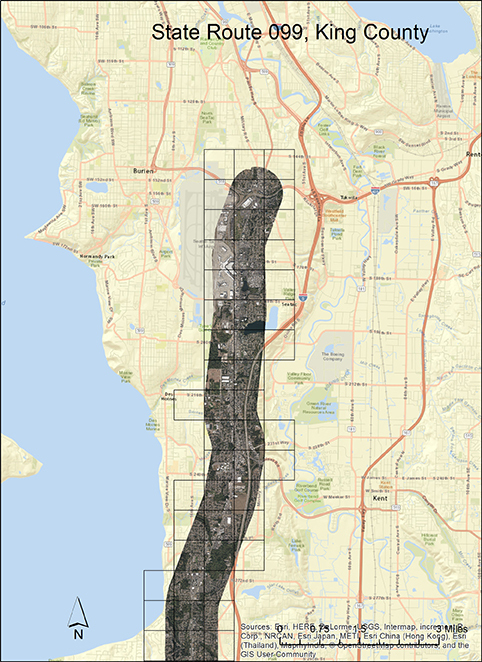 Under a previous task order on the same contract, Tetra Tech had performed the aerotriangulation for 3851 images in King County and 2400 images in Snohomish County. Aerotriangulation for the other counties had been completed by other contractors. 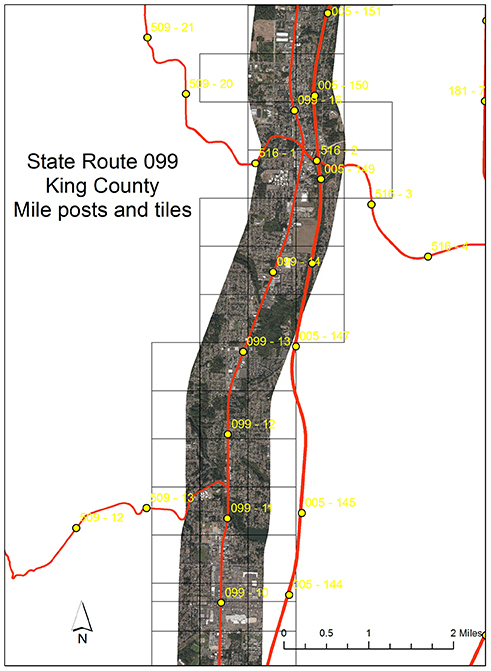 The orthoimagery that Tetra Tech was tasked to deliver covered parts of over 110 State Routes in King, Snohomish, Pierce and Thurston, Clark, Kitsap, Whatcom, Island and Skagit counties, as well as in several counties in Eastern Washington. A total of over 15,000 raw images were orthorectified, mosaicked and tiled. The imagery was 4 band, 16 bit imagery which resulted in over 20 terabyte of input data. The task orders asked for ‘uncorrected orthoimagery’ meaning that unlike standard processing, bridges were not to be geometrically corrected in the imagery. Existing publically available elevation data was used for rectification. Most of the elevation data was downloaded and assembled from the Puget Sound LiDAR consortium web site. The ground resolution of the imagery was 0.25 foot. For each of the 110 state routes a tiling scheme was developed. Organization and naming of the tiles was based on the Washington State Mile post system and organized in 10 mile segments. Imagery was clipped to 1 mile buffers along the routes. Tetra Tech made incremental deliveries and met or exceeded the estimated delivery schedule.